How Would You Cut Defense? 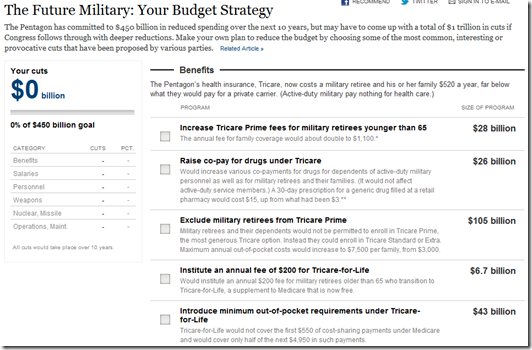 The NYT presents a list of options for you to decide how to trim defense spending. As usual, it’s not quite as easy as you might think – but I still got it up over $800 billion. I like this interactive way of educating people about budget issues. 3 Responses to How Would You Cut Defense? Most fun I had since budget hero! Why doesn’t the trillion dollars of entitlement spending (read: Steal From the Rich and Give to Our Cronies) ever even see a chopping block, much less get any part of it placed thereon? How about slashing federal subsidies for ethanol? Or (even simpler) how about just getting the government out of the subsidy bizness altogether, since governments shouldn’t be deciding which businesses win or lose anyway? Maybe because the United States spends more on defense than the next 17 countries combined and that there is no real threat that justifies spending so much?